Olebogeng Sentsho is a serial entrepreneur with interests in mining and energy. She is currently the Founder and Head of Operations at Yeabo Mining, a strategic waste management company with plants in and around Limpopo. 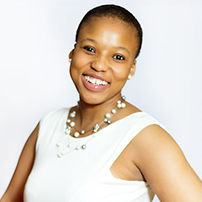 Olebogeng studied law at the University of the Witwatersrand and is currently pursuing her Masters degree in Business Administration. Mrs Sentsho is also the Founding Chief Executive officer of the Mining Innovation Initiative of South Africa: a non-profit organisation of businesses and individuals in mining and mining services. MIISA works to promote, enhance, innovate and improve the mining climate in South Africa by catalysing innovation and promoting thought leadership and mining development to the general public, protecting the rights of mining businesses, and assisting these businesses to improve their sales and profits while actively enhancing their contribution to the communities in which they exist. A recipient of the inaugural “Outstanding woman in Mining Award” at the Youth in Mining Business awards, The Head of the Mining and Technical Engineering Services Sector at the Progressive Youth in Business Organisation and a panelist at the recently held “Youth in Mining Procurement Transformation Summit”, Olebogeng is passionate about investment, the African economy, mining and socially responsible business practices. She believes that a more structured and Afro-centric approach to mining will grow the African economy and enable Africa to benefit from the minerals it rightfully owns. Olebogeng’s short term career objective is to catalyse the creation of South Africa’s ter-tiary mining industry: where the industry will interact directly with raw minerals and benefiate them. To this end, she wants to establish a steel foundry that interacts with iron ore throughout its extensive value chain. Olebogeng is of the opinion that this will create jobs and empower those employed with skills to expand on this value chain and become their own bosses, running businesses that work in tandem with the steel factory. Her long term career objective is to create other industrialists throughout Africa who share the vision of a prosperous and economically active continent driven by Africans for Afri-cans. Olebogeng believes it is incumbent on the youth to take advantage of its opportuni-ties and replicate them for others on the continent. Mrs Sentsho believes in the dawn of Africa’s secondary economy driven by industry and the green economy.